The holidays always make us think of sharing... Time, smiles, gifts, and of course - appreciation for one another. We offer tons of ways to share with your friends and co-workers! So what IS a Corporate Package? Corporate Packages are a collection of one-of-a-kind gifts inspired by your company or your idea and created WITH the Carlyn Ray Designs’ team. 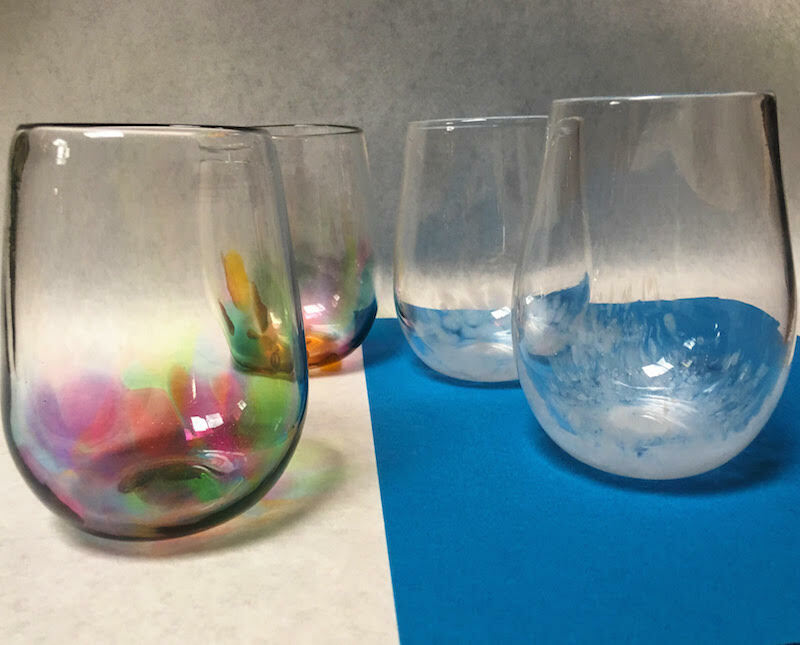 These can include, but are definitely not limited to: Blown ornaments, hand sculpted awards, blown candy dishes, stemless wine glasses, card holders, tumblers/mugs – the possibilities are truly endless! And of course, these can all be made to suit your company’s specific color palette or gift’s occasion. For these packages, we offer several options to inspire everyone’s individual needs. That could mean you work with Carlyn to come up with a concept for your gift and submit an order with our team of skilled artisans. Or it could mean that your whole team comes down to spend some time together at the studio while they create their own ornament, flower, or bubble bowl, or another item from our preselected shapes. 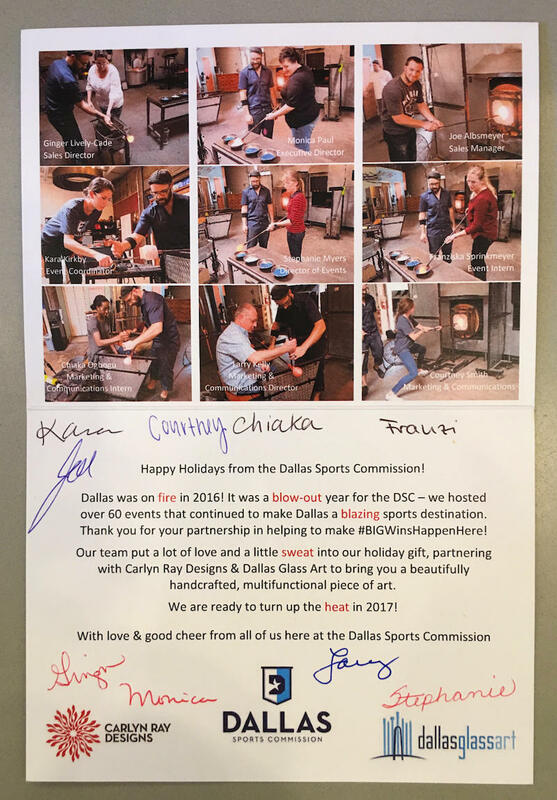 If you choose to have us host your event, keep in mind that we not only offer hot glass classes but fusing classes as well! Fusing is great for those looking for something more relaxing and meditative, or anyone looking for something a little different. With any class you choose, catering is always welcome and we can accommodate parties of up to 50 participants! The Dallas Sports Commission brought a unique idea to us. While they had placed an order for 60 bowls to give to their clients, they also scheduled a group event for the nine members of their leadership team to come in and make a bowl of their own. During their event, they requested that we take pictures of them going through the process of making their bowl. Once we filled their order, they compiled the photos taken at their event onto a card which was delivered alongside every bowl; giving the notion that the leadership team was a part of each gift! What a warm personal touch to add to their gift of custom art! Marilyn is a designer that we work with often. She is a pleasure to work with and is always up to try a new idea. On this occasion, she was having a party and needed place card holders for each attendee. With October right around the corner, Carlyn and Marilyn decided on small pumpkins with the stem of each formed to neatly hold a small name card for the table. Each of these adorable little pumpkins was unique to one another and Marilyn and the whole team here were very pleased with how they came out! Theo Executive had commissioned us to create some custom art for their new offices. We had a very specific deadline to meet as they were having an event to celebrate the completion of the renovations. At this event, they wanted to gift their clients. Our small candy dishes were just what they were looking for! We created 44 bowls for them and had them gift wrapped and delivered in time for their event. Other individuals, couples, and companies have also liked giving our signature wine glasses as appreciation gifts.